Even more good news is that the number might increase to 20 - 25 schools in the coming few months as and when the marketing efforts taken by Al Mumayaz starts Fingertec and Magnum Connect as their technology partners, reaches all the other related schools. 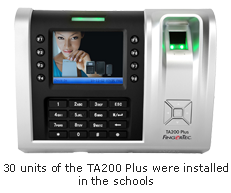 Thirty units of FingerTec TA200 Plus was installed in all the above mentioned schools in the region of Ras Al Khaimah in UAE. Some of the mentioned schools are using these units to monitor the flow of student batches in Computer Lab and Libraries while the other schools deployed the FingerTec units to monitor and manage their staff attendance as well as for general administration purposes. With the TCMS V2 software, these schools are also able to generate and store long term records and attendance reports generated from the TA200 Plus terminals. Why choose FingerTec? The local presence of a FingerTec reseller in RAK and the availability of a local distributor equipped with a support team was the differentiating factor in all these schools that selected the FingerTec TA200 Plus. There was a rather tight competition indeed from other local vendors and Eastern companies, but when looking at long terms prospects of all the schools following the trend, FingerTec emerged victorious. The key was not only in the support team of the local distributor, but also in how the product presents itself as DIY as biometrics can possibly get. With a website dedicated to FingerTec’s end users and features such as manual downloads and warranty claim all a few clicks away, it is not hard to see why our client’s preference leans over to FingerTec. Copyright © 2011 FingerTec Worldwide Limited. All rights reserved.